CII Indian Women Network Western Region is organizing a Workshop which will help the IC Members to conduct formal investigation, help them with interviewing tips, legal requirements, drawing conclusions, assessing credibility and deciding on corrective action. This workshop will also cover closing procedures, timelines to be followed, penalties for contravention of provisions and tips to write a report. 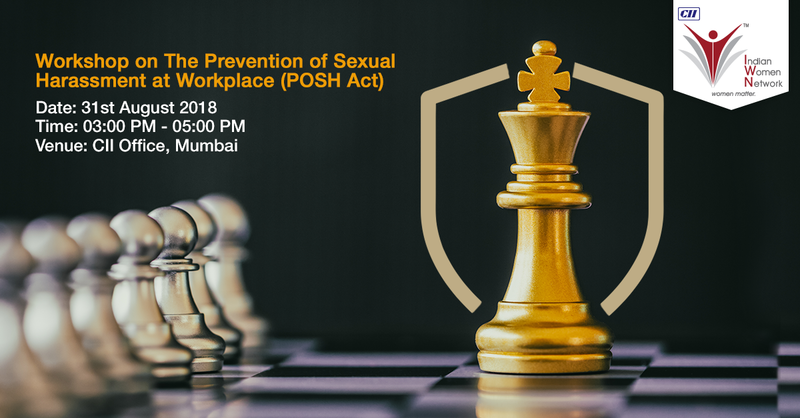 A recent study says, 23% of organizations are not fully compliant to the Prevention of Sexual Harassment Act, 2013 – Despite the legal implications and the seriousness of the issue almost a quarter of the organizations are not complying with the Act in totality. The important aspect of the Sexual Harassment of Women (Prevention Prohibition and Redressal) Act 2013 is role of an Internal Committee Member (IC) at workplace. IC must oversee the implementation of Anti Sexual Harassment Policy, deliberate and resolve on sexual harassment at workplace and recommend disciplinary actions if any, to the employer.